Took a trip with Domestique to watch Paris Roubaix yesterday. We were there nice and early so had a wander along paves sections 4 and 3 by the Cafe L'abbre. As we were walking back towards the Cafe the Junior race arrived with a single Russian a couple of minutes ahead of the rest of the pack. Cameras came out and started clicking just as the leader came round the left hand corner. 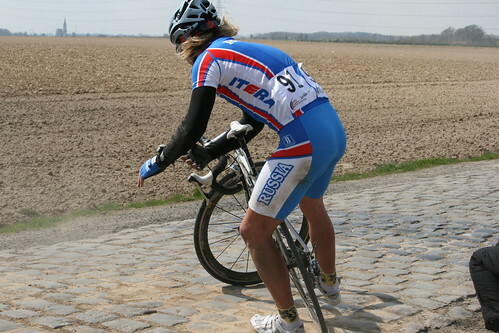 He was right on the gravel at the edge of the road so he could avoid the cobbles... oohhhh dear big problem there is some woman sitting right on the gravel at the exit of the bend... Russian swervs back onto the cobbles and rear wheel steps out from underneath him.. OUCH.. Sorry should have included this in the original post. He got up and dusted himself off. Mechanics put his chain back on and he tore off into the dust. He wasn't clutching any damaged bones, and no obvious cuts or grazes. He appeared to be fine as he rode away. Oh, good news. Great photos, btw. Well as a professional photographer I must applaud up - great pics and hard to believe they are captured with a compact - mine would only take one in the amount of time yours has taken the sequence! Page created in 1.86 seconds with 24 queries.